I am SOOOO excited right now. First off, so many of you have sent in questions over the last 2 weeks, and I promise(!) I will personally answer each and every one of them! However, I just had to let you all know that not only am I leaving the country for a 2 week vacation today (I plan to do a special on-the-road video podcast from Italy, so keep checking back this week! ), but my trusty old G4 laptop finally died on me last week, and that's why I haven't responded to you all as promptly as I usually do. Of course, it had to happen RIGHT before I left for holiday (that's Murphy's Law, right?) but at least I got a cool new MacBook out of it! Anyhow, I did lose a few emails from you all, however I think it was only 3-5 in total...I do have the rest saved and plan on writing responses while waiting at airports and train stations in Europe. :) So if you sent me an email early last week or the week before that, can you please re-send it to me just to make sure I get to your question? And I happen to think that a special video podcast will be a nice consolation prize, given that I can get decent internet connections while on the road! 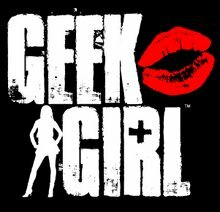 The topic will be totally impromptu (I just had the idea this morning), there won't be the usual Geek Girl backdrop or glasses(! ), and I think it's going to be very useful for those of you who travel! To email me your questions, or even video questions for a chance to be featured in a future podcast, email me at geek.girl@earthlink.net. And make sure to subscribe to my videos on iTunes...they are FREE and the quality on iTunes is way better than on YouTube. Plus, you can take me with you on your iPod. :) See you all in Cyberspace soon! 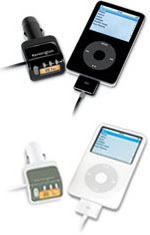 So many of you have been emailing me over the last two days about the iPod transmitter that I recommended to Ross "the Intern" Mathews after he mentioned it on his blog (click HERE to check it out), that I decided to post a whole blog about it. Also, Episode 3 of my Video Podcast, which is coming up soon, is going to feature all of my favorite gadgets, and I will be including this transmitter in that video as well. your car cigarette lighter acts as the power source for the transmitter. you turn on your iPod and play it, and the transmitter actually transmits what your iPod is playing via the preset station you have selected, and your car radio receiver picks it up. It's like your own mini-broadcast radio station in your car! But here's the drawback: no matter how good a transmitter you get, you are still dealing with radio waves. Radio waves, even on the best, biggest stations cut out when you are out of the area (i.e. when you go on road trips and there are long stretches of road where you can't get ANY reception). Lots of environmental factors also influence radio waves, such as weather and clouds (random fact: did you know that at night, if the cloud coverage and temperature are just right, you can pick up AM stations over the radio that you couldn't pick up normally? The radio waves actually bounce off the clouds and reflect back down to earth in places they wouldn't normally transmit. Neat, right? Actually, if anyone reading this knows more about that phenomenon, please post about it in the COMMENT section below...I'd love to hear more about it!). And it has a Patented Aerielle wireless technology, which enhances noise reduction and stereo separation. So there you go, blog buddies. Everything you wanted to know about the transmitter. I personally think it's also worth it, if you have the money and a car that will allow for this type of hook up, that you have your iPod cord installed in your car. Then you just plug in your iPod like you would to your computer, and control it via your car CD control buttons, as opposed to the radio. If you do it this way, there is absolutely no radio interference because the car stereo treats the iPod input like a CD, as opposed to a radio wave. Ok fellow geeks and geeks-in-training...that's all for now! To email me your questions, or even video questions for a chance to be featured in a future podcast, email me at geek.girl@earthlink.net.